Infloor’s signature Standard Electric Cable is low-profile and can be easily sized for any project, making it a great choice for bathrooms, kitchens, living rooms, small offices, and remodeling projects. The cable ranges from 10-15 watts a square foot, offered in 120V and 240V, comes with a 25-year limited warranty, and is UL listed for both wet and dry indoor locations. Our Standard Electric Cable is recommended to be used under tile, laminate, marble, and stone floor coverings. Infloor Electric Cable is the best! 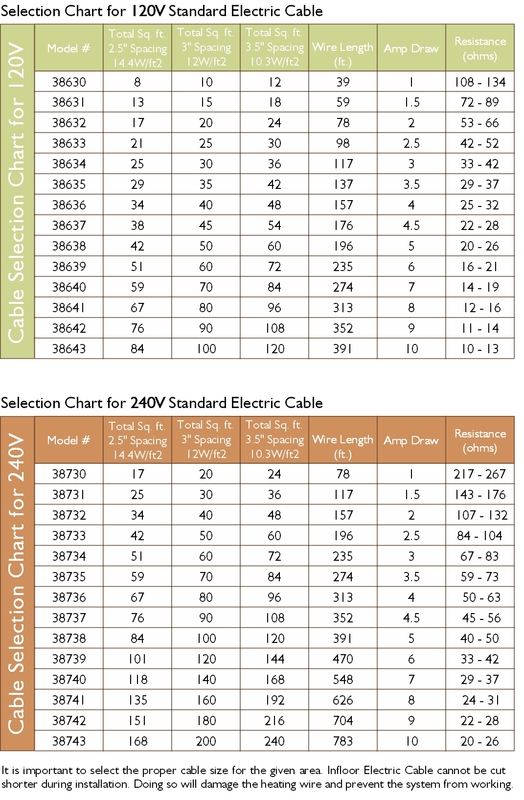 *Click on the cable selection charts below for a larger view.